For the past several weeks I have been trying to contact an account supervisor who was recommended by a candidate who is also a dear friend. The AS told my friend that she really wants to meet me but is very busy. Totally understandable. But in three weeks she has not called back – even late after work knowing that she will get my voice mail. I have bounced this thought off of many candidates and friends who are over 40. When we were young in business and a recruiter called, we called back immediately - or, at the least, at the first opportunity. Why? Because it meant that someone might be interested in me and my career. Maybe they just wanted to meet me; maybe they had a specific thought about my next move. I wrote two of my first Ad Age columns about this. The first was about what to do when a headhunter calls and the second was how to work with a recruiter. I have also used these subjects extensively on this blog. It occurs to me that many people in their first few years of business just don’t have a clue. Why should they? It is just that recruiters, for the most part, have been eliminated by many ad agencies for jobs under $60k. Every ad agency corporate recruiter complains to me that they have trouble finding assistants, account executives and junior supervisors with or without recruiters. I am not surprised. Millennials don’t return calls and are no longer exposed to recruiters until they are well into their careers. And of course, they hear that most of their friends got jobs through networking, which, to their mind, means recruiters are superfluous. Not surprisingly, recruiters have always only accounted for a small percentage of jobs. The statistic I have heard, even years ago, was that networking actually accounts for 75-80% of all jobs. It has always been that way. Today, given the economy, it might be even higher. Of course as jobs get more senior and the pyramid becomes narrower, recruiters account for a greater percentage of jobs. Recruiters are definitely necessary. Today, when a recruiter calls a millennial returning the call gets put on the back burner. Like every recruiter, we get calls from junior executives, especially those who have been laid off. The longer they are out of work, the more often they call. But when they get a job, they stop calling. Few bother to call to tell us that they have landed. Sometimes we get emails that read, “Hi: Thanks for your help. I just got a great job so I no longer need your services.” I will always email these people back and ask where they are going, what their title will be, what their salary will be as well as who their clients will be. Sometimes I get an answer, sometimes not. There is virtually no understanding of the long term relationship or the fact that by adding to their résumé, I might be able to find them something wonderful in a year or two. To them, and in fact to many executives, recruiters are like job wholesalers. We are only to be used when needed. That part is a shame. There are people I have never been able to place, but with whom I have had a relationship for many years. They call me for job advice and to bounce ideas off me. I am only too happy to oblige. Our value to a career cannot be overstated. A relationship with a good recruiter is invaluable. We are only too happy to help. Here is the scenario: You are out of work. You have lots of experience. You have worked on multiple categories – automotive, consumer package goods, insurance, consumer electronics. You can pretty much work on anything. You hear about a job at one of your target ad agencies working on a retail bank account and you know, you absolutely are sure, it is perfect for you. But you can’t get them to see you. It makes no sense to you. You hear about people they are talking to who have banking experience and you know you are better, smarter and quicker than they are. But still you cannot get in to see them. This is an all too common situation. I have written extensively about it. It drives me nuts. But here is the reason you can’t get seen. In this economy it is all too often a question of your specific skill set and experience. Recruiters, and that includes people on my side of the business as well as those who work in human resources at a company, get paid to find the right candidate for a job. Generally, companies give us specific job specs. All too often those specifications include specific category experience. All of us are constantly barraged by résumé submissions and assaulted by candidates who believe that they are qualified and able to do a job, but who actually lack the skills to do it because they have not worked in that category. I recently did something I rarely do – I posted a job on the Ladders for a director of finance at a very good young agency. My posting was very clear in that I had to have candidates with direct, recent ad agency experience. I received almost 200 responses. That is right, two hundred. Unfortunately, only six were from ad agency financial people. I made the mistake of responding to one very aggressive non-agency candidate and explained to him that, based on the criteria given to me by my client, he was unqualified for the job because he had no ad agency experience. I got an email lecture from him about how all accounting jobs are the same. But from firsthand experience, I know that is not true. There are peculiarities to the ad agency financial business (e.g. sales tax issues) which require prior knowledge and he simply wasn’t qualified. Besides, it doesn’t matter. My job is to send candidates to my client with the backgrounds they require. The issue is that while this candidate wanted the job and, given some training, probably could do it competently, he was not able to do it yet. Recruiters don’t get hired to find people who want to do a job. We get hired to find people who can do it. Now. Sadly, all recruiters are paid to put square pegs in square holes. That is not to say that we can’t be creative and, when we know the hiring manager, we can ask them to do the interview. Every once in a while that pays off, but rarely. I have previously posted about why people can’t go backwards. I have also posted about the difficulty of placing out of the box candidates. It isn’t that we don’t want to place you. It is just that we can’t. We are constantly getting job specifications that require category experience as one of the criteria for submitting a candidate. You know, pharmaceutical accounts only want people with pharma experience and package goods accounts only want CPG people and financial people working on financial accounts. And that is certainly not to say that a good financial account person couldn’t succeed admirably on a package goods account. Of course agencies should hire people not résumés. But this is the real world. Unfortunately, all too often prior experience triumphs over talent. I had an incident a couple of weeks ago. A candidate who had been introduced to an agency in early January was on a last interview. The client stood her up. Despite the client’s protestations, the candidate dropped out. And I don’t blame her. It was actually the third time this same agency had her show up in their offices and no interview happened. The first two times, the hiring manager forgot to write the interviews in her calendar. (I was then instructed to send one of those Outlook Invitations, as if it were my fault.) The final time was the candidate’s last interview and she was meeting the boss. Somehow, despite the email chain confirming the interview, it was not on his calendar. The candidate questioned the nature of the job and the company. Ironically, I have placed several people at this agency and they all love it. But can you blame the candidate? No reason why she should take my word for it when the company’s actions speak much louder. I have said it before, a candidate’s time is just as valuable to him or her as the time is for the people doing the hiring. Standing up a candidate once in inexcusable. Doing it three times is beyond explanation. While national unemployment is steady at a little over 8%, I believe advertising unemployment is at about 12-14% based on 2007/08 levels. There are lots of good people on the street. And there are a lot of good people who are unhappily employed. The hiring issue is always the same. The problem for every company is always talent. We get jobs from companies who have been trying to fill the job themselves for months and they cannot find the right combination of experience and personality. All I can say is that when a company finds that perfect combination, they have to find a way to move quickly and nicely. While speed is of the essence, being nice cannot be overstated. Candidates need to feel good about potential employers. 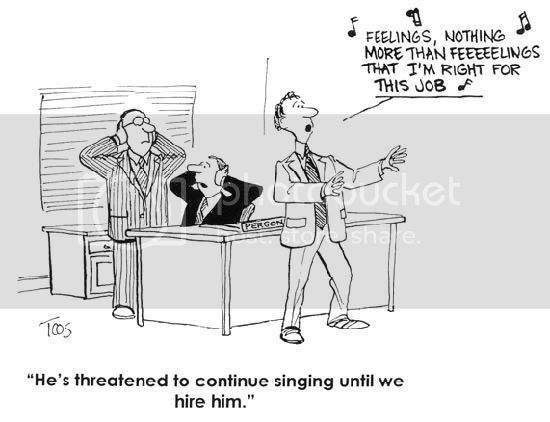 After all, they understand that their potential employer is or should be on best behavior when they are interviewing. If they can’t be nice during the interviewing process, what will they be when the employee gets there? As all recruiters - both on my side of the business and corporate HR/recruiters - know, there is a rhythm to a successful interviewing process. The process may start slowly but it builds momentum. If that rhythm is interrupted for too long a period of time, the potential placement may fall off. When the aforementioned candidate was stood up the first and second time, I tried to get the hiring manager to apologize. It didn’t happen. But the hiring manager is very nice and her personality won the candidate over and back. But when the boss missed the final interview, whatever rhythm and momentum was there was completely lost. In the end, both the boss and the hiring manager blamed each other. I begged them to reach out to the candidate; I thought it could have been repaired. A simple, “I’m sorry” might have sufficed. It never happened. Then, of course, they blamed me. And, finally, they blamed the candidate, "If she was so thin skinned as to be bothered by missed appointments, she didn't belong here." What more can I say? The Person Reading Your Resume Will Spend Six Seconds On It! One of my most popular Ad Age articles was entitled, “Ten Things You Didn’t Know About Your Résumé”. I wrote it because I knew how hiring managers and corporate recruiters use résumés. Recently, I was proven right by an article which appeared in Business Insider. It seems that The Ladders has conducted a study on recruiter’s decision- making behavior. They reported that the average time spent on a résumé is six seconds. That’s right. Six seconds. The research indicated that what recruiters look at is name, current title and company, start and end dates, previous title and company as well as previous company start and end dates. They also look at education. This plays directly into my advice: all anyone wants to know is where did you work, how long did you work there, did you get promoted and what did you do there. I recently received a résumé which, in an effort to keep it to one page, had so much information on it as to become completely unreadable - it was typed in (literally), eight point type, the margins stretched to the boarders of both sides of the paper and, in fact, the bottom was so tight that the last line of text did not print. What does this say about the candidate? Résumé writers, including professionals who charge for this service are wasting your time and money if they are putting down all the things which you have accomplished and achieved. Yes, a good résumé should have a couple of those points, but they should not detract from the important information. Most people spend an inordinate amount of time describing their job functions. If you are an advertising account person looking for another advertising job, it is unnecessary to put down that you are the liaison to the client or that you work with creative – virtually everyone who sees your résumé will know that these are the things that you do. Much more important, for instance, is that you have supervised the production of ten television commercials from concept to production or that you developed a new strategy for your client's advertising. Remember, a résumé is an ad for yourself. Your résumé will mostly be used as an interview guide so put down things you want to talk about so people will ask you about them. One of the things that I found really interesting and revealing about the Ladders research is their admonishment that a résumé should not contain distracting elements – like client logos (I see this all the time). Those elements actually detract from reading the relevant information on a CV. The research was based on 30 professional recruiters and examined and tracked their eye movements over a ten week period. It shows two different résumés and how they are viewed. The simple one fared better. When creating your résumé, take heed.